Extreme flexibility of Supa Flex Markers minimizes damage to vehicles striking them and enables them to continue to function as road edge guide posts even after repeated collisions. 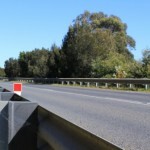 Supa Flex posts were tested to 10 impacts head on into traffic at speeds of 100Kph and 5 impacts at an angle approximately 75' to the traffic face at speeds of 90Kph. The posts remained capable of self erecting and remained serviceable after these impacts. 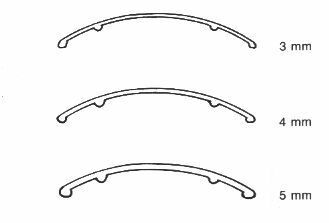 Available in 3mm, 4mm and 5mm thickness at 1400mm or length to order. Manufactured from UV stabilized, impact modified, recyclable, white uPVC. 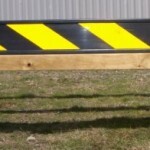 Class 1 Reflective Red & White delineation can be fixed to client specifications. 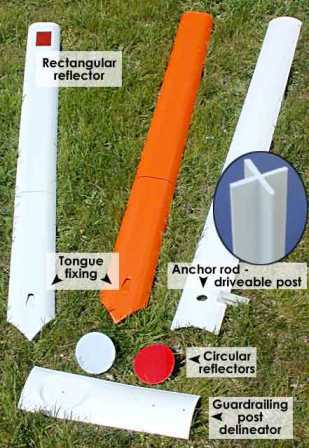 Can be supplied as a non-driveable post - manufactured with a 25mm hole to suit an ancchor rod in a transverse horizontal position, to resist extraction. 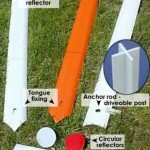 The anchor rod is 140mm x 25mm uPVC providing maximum retention capability. 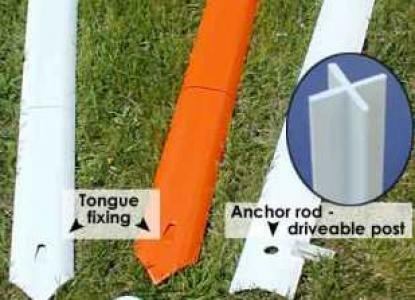 Driveable Posts may be supplied with a tongue to resist extraction, with the bottom end being pointed to assist driving.